' the Woodlouse: Mud, Mud, Glorius Mud! 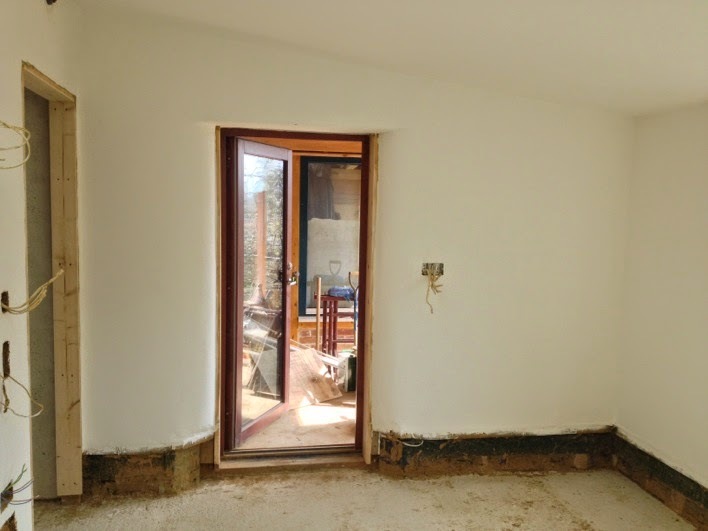 I've been meaning to write this post about clay plaster for ages. 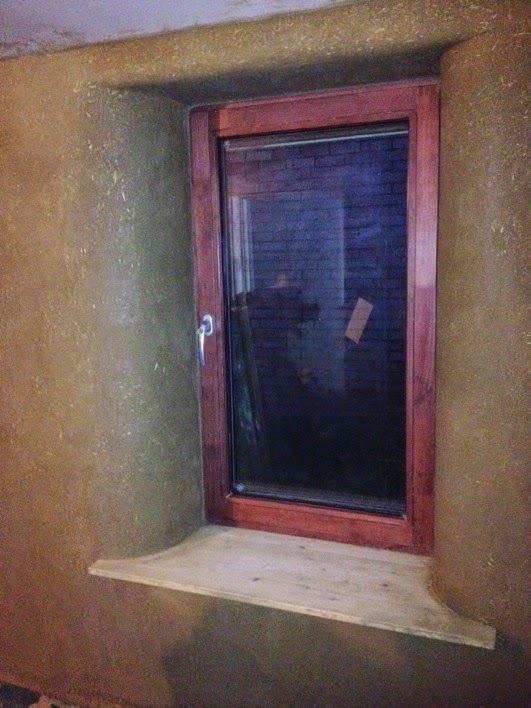 The delay does at least mean that the clay plastering is now finished (hurrah!) so I can include some photos of some posh-looking walls to round off all the shots of mud. Clay is, of course, wonderful. In all its states it is an incredibly versatile material that has many applications (toothpaste, paper, crockery, insulators on electricity supply lines, clarifying water and wine, bricks, tiles, mud fights, filtration, pond-lining, and plaster to name a random few). It's inert, non-toxic (the dust can be hazardous if breathed in in large quantities - but the build up of any kind of dust in your lungs is best avoided) and it's readily available in many parts of the world. Incredibly low embodied energy and associated carbon emissions. 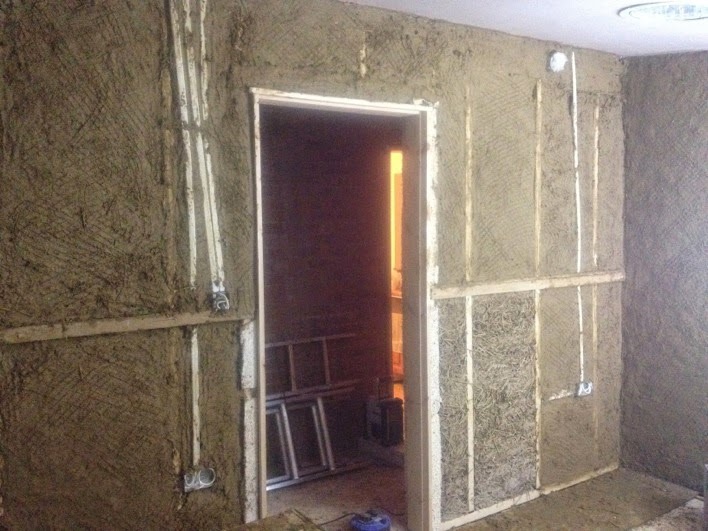 Even commercially produced clays or clay-plasters require massively less energy to produce compared to any other plaster (eg: standard gypsum plaster, lime plaster, cement etc). Crucially, unlike the main ingredients of most plasters the clay is used raw - it is not fired or subjected to energy-hungry heat treatment. Low cost. If sourced on site during construction, the clay is essentially free. Our clay is the spoil from the holes that were dug for a rainwater harvesting tank and soakaway. 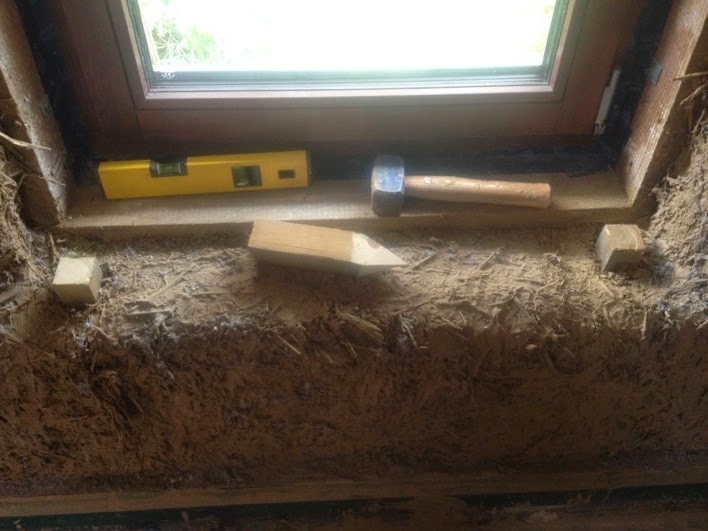 In some cases the clay dug out from foundation trenches can be used. Thermal mass. 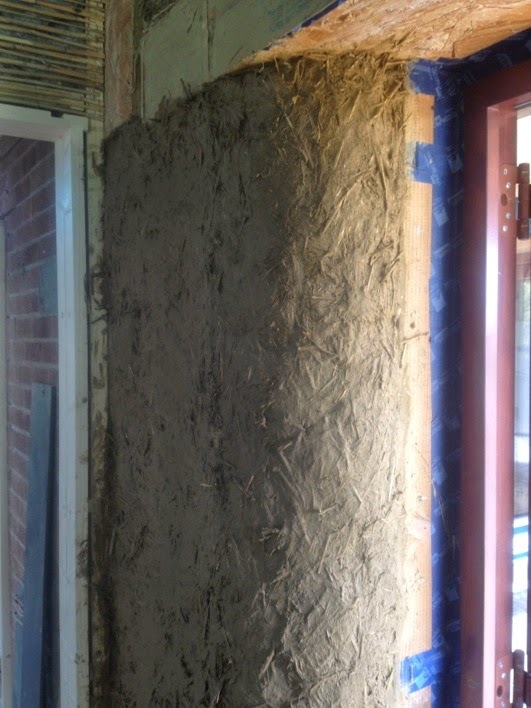 Clay plaster will help maintain an even temperature in your building by storing heat during warmer periods and releasing it slowly during cooler periods. Breathability / vapour-open construction. Clay-plaster is especially good for this. 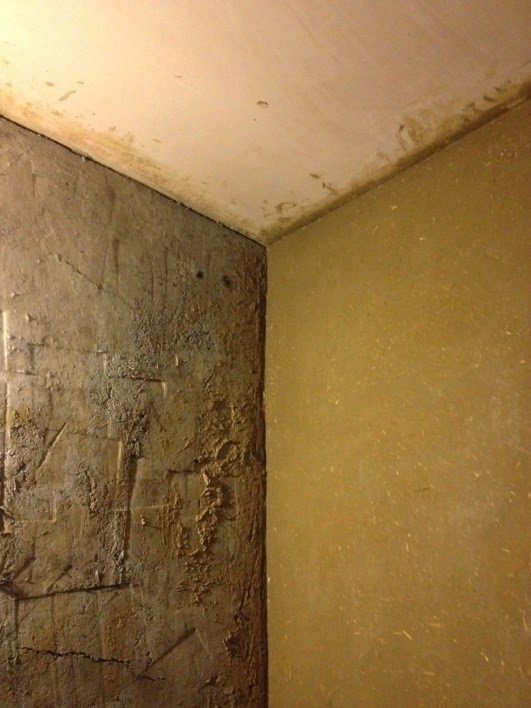 Allowing moisture to escape through and from the walls helps prevent condensation on the surfaces or within the walls, preventing mould growth and rot. It's lovely. Really, it is. 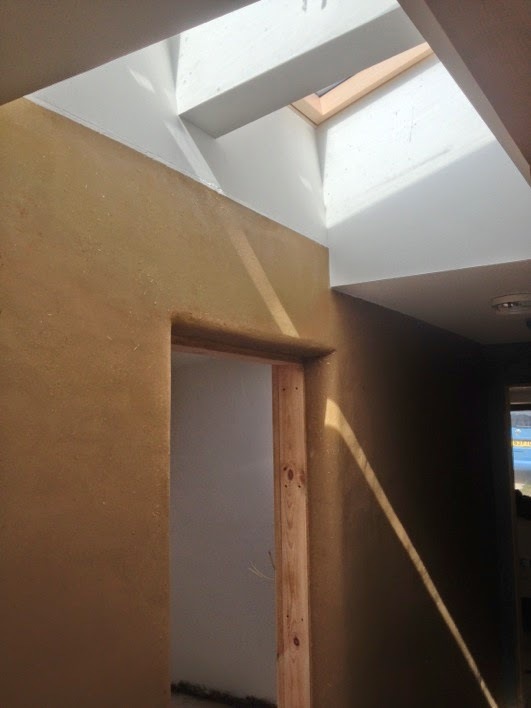 Clay plaster can be easily sculpted into different shapes or smoothed to an even surface, allowing for greater flexibility of design. 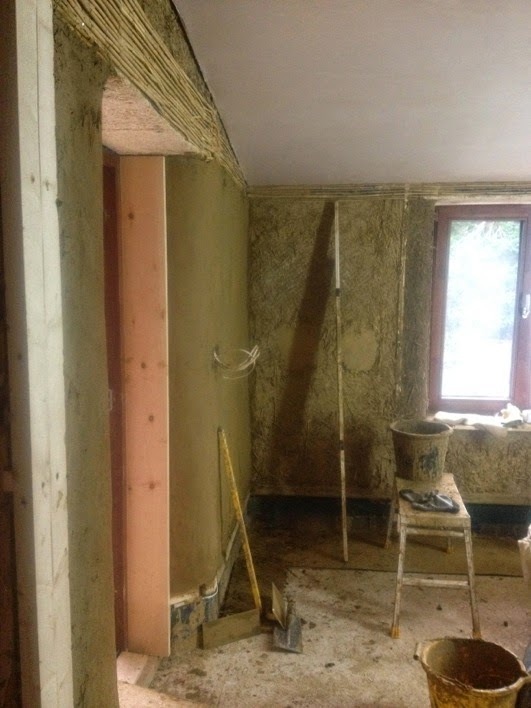 As it takes longer to dry than other plasters it is also much more forgiving and very well-suited to self-builders. 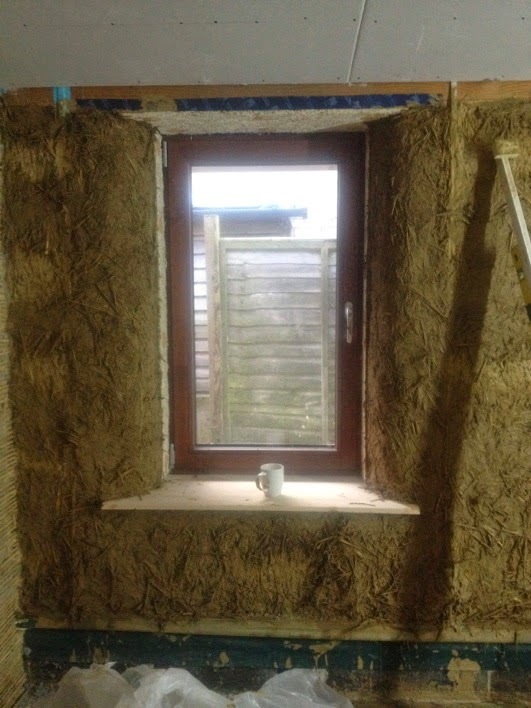 Generally, it's the perfect partner for strawbale walls, allowing them to breath, adding to the heat-storage effect of bales, and perfectly matching the sculptability of straw. It's a very high-performance, low-technology solution, which makes me love it all the more. There are different combinations of materials that can be used for clay plasters. The recipe used on any build will be determined by the available materials, preferences of the builders/clients, and properties of the clay used. 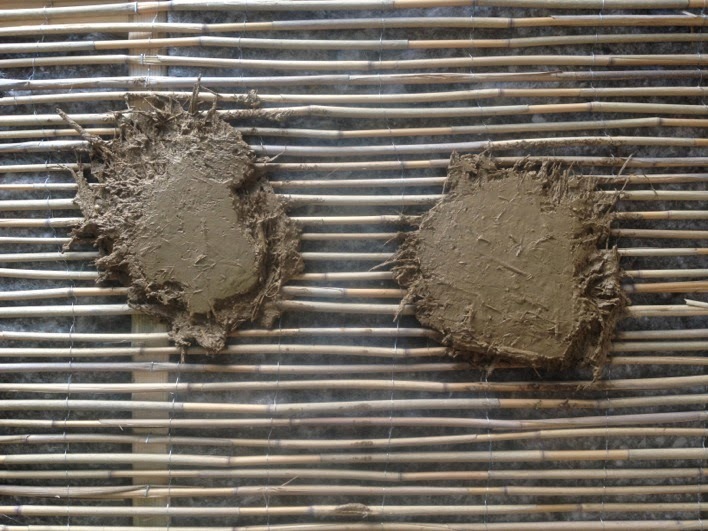 Some clays act as much stronger binders (sticking all the ingredients of the plaster together), some are more plastic (malleable and easy to shape), different clays will shrink different amounts as they dry (affecting among other things, how wet the plaster can be applied). 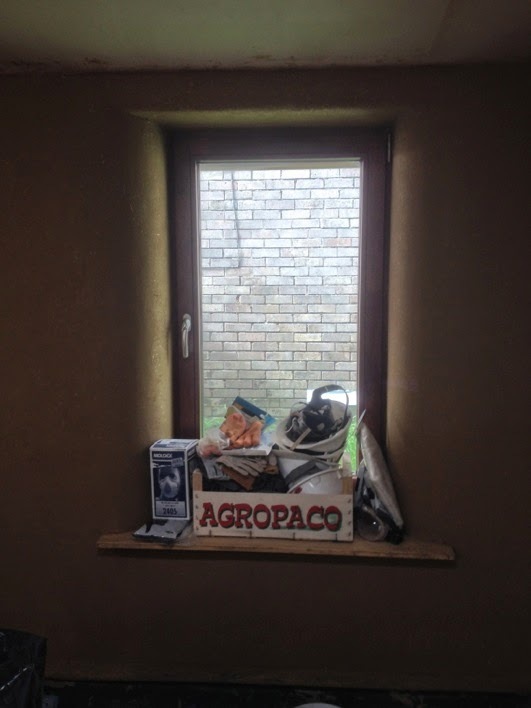 The basic ingredients are clay and aggregate: usually either sand and/or chopped straw. 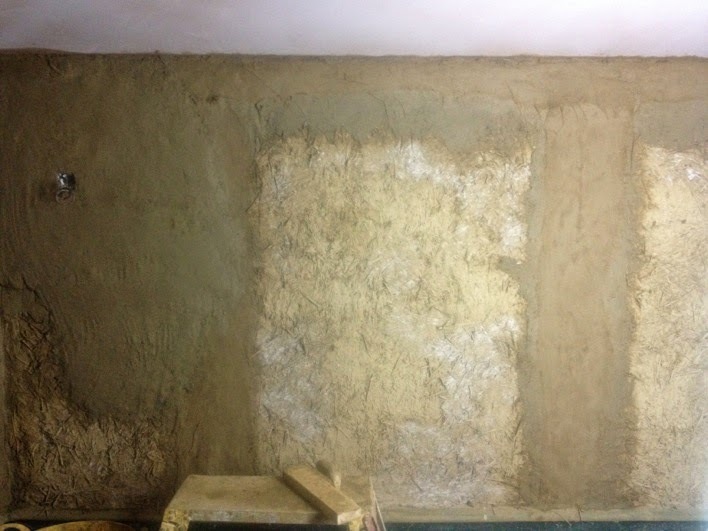 We opted for a straw-rich mix which allowed for a higher proportion of clay in the plaster without excessive cracking (the straw-fibres reinforce the clay, and help reduce the shrinkage which is the main cause of cracking). 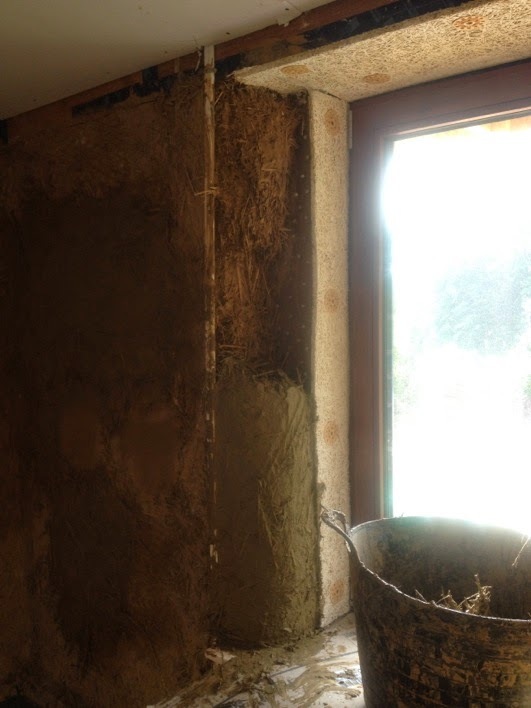 Using as much clay in the mix as possible maximises the hygroscopic and thermal storage properties of the plaster. It also makes for a lovely finish, and a lovely feel for a complete clay-head like myself. 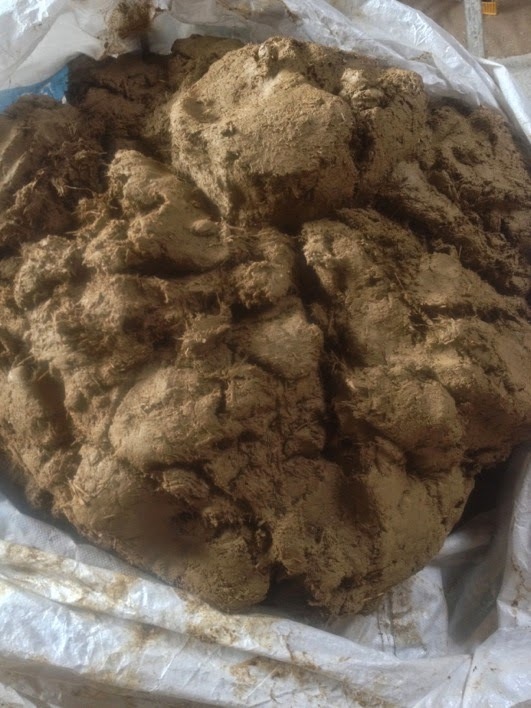 After trying various combinations we used a main body-coat mix of 2 parts clay, 2 parts chopped straw, and 1 part sand (the sand needs to be a "well graded sharp sand" - sand with a range of particle sizes from 4mm diameter down, from which any clay or silt has been washed. This was available locally as "plastering sand" or in a coarser form as "sharp washed pit sand"). 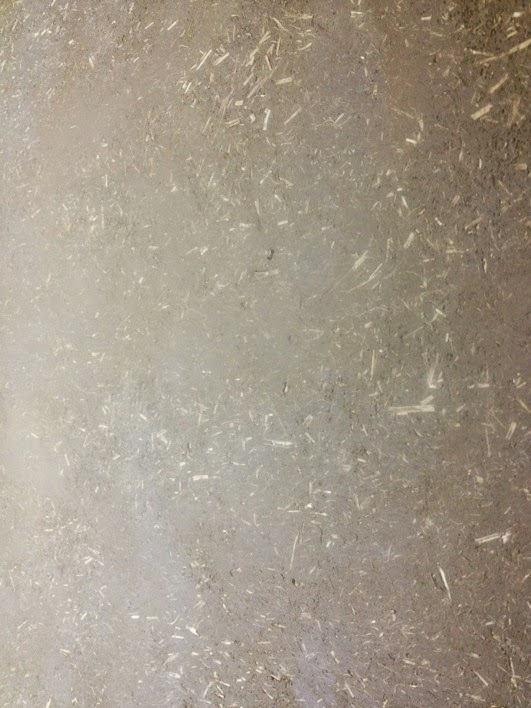 This mix did crack quite a lot and was harder to get really smooth due to the high straw content, so for the finish-coat we use 2 clay, 2 chopped straw, and 2 sand. 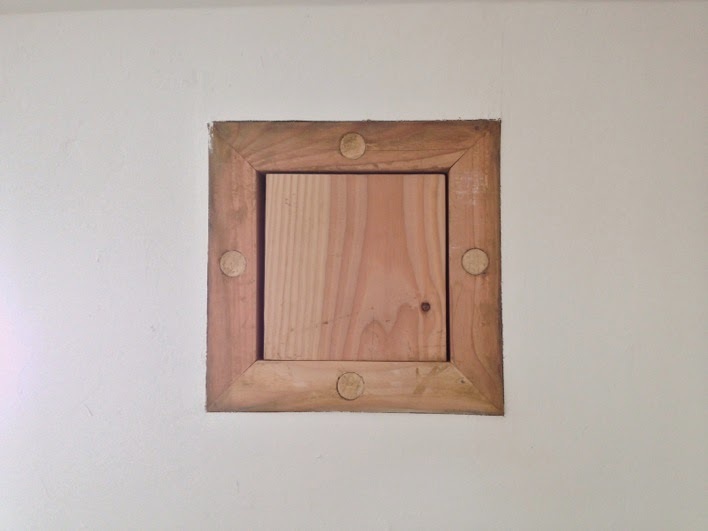 There's another video below, showing a snippet of me doing a not-very-good job of clay plastering the body coat onto one of the timber-stud and reed-mat walls. Clay plastering can be quite slow. It definitely benefits from having a good group of volunteers or workers who can get through it all quickly. Due largely to poor-organisation skills I didn't sort this out, so did all of the slip-coat (the first coat onto the bare straw, of pure slip - just clay and water - which binds the surface of the straw together and makes an excellent surface for sticking later layers of plaster to), all of the sculpting mix (a mix of clay slip and long straw, used to sculpt window-reveals and fill out dips - usually between joins in bales), and most of the body coat by myself. After having some wonderful but very sporadic help from friends and volunteers, I finally got one excellent regular helper (Emily) as we finished the body coat in the last room, then a second (Celia) as we started the finish coats. It was really gratifying for me to see the change from when they first started to when they finished. At first they worked alongside me and did a pretty good job, then I'd go over their patch of wall and even it up; by the end I was able to leave them to complete walls on their own while I dealt with other things. I strongly (and only slightly grudgingly) suspect they were better than me by the end. At first I kept the plaster mixes as dry as possible (almost like a putty consistency) to keep cracking to a minimum. Towards the end the mixes were wetter which made them much easier and quicker to apply. As long as the plaster was very thoroughly trowelled over it didn't crack too much. None of the mixes we used were really suitable for putting on the walls with a trowel - I think they would have needed more sand in order to flow well-enough for that, and I found sand-rich mixes more crumbly when dry (the clay-rich mix made a really durable surface when trowelled down). 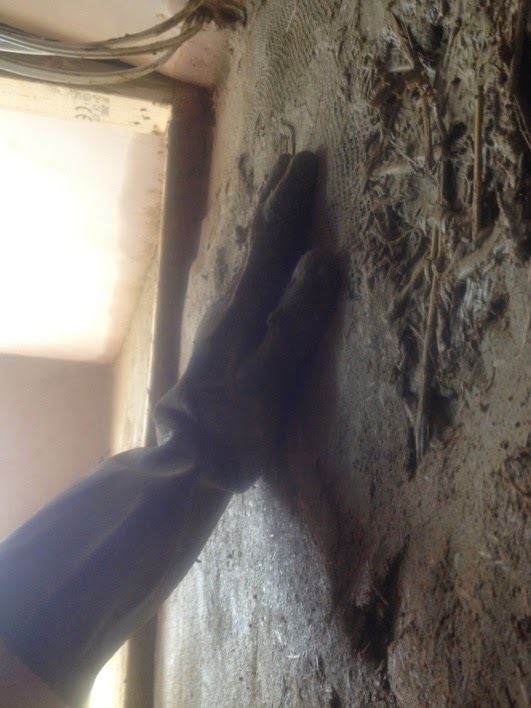 We put all the plaster on by hand, doing much of the sculpting and levelling also by hand, then used a metal plastering trowel to smooth it, even out bumps and reveal dips to fill, and compress the plaster. Compressing it makes it stronger and reduces the shrinkage. 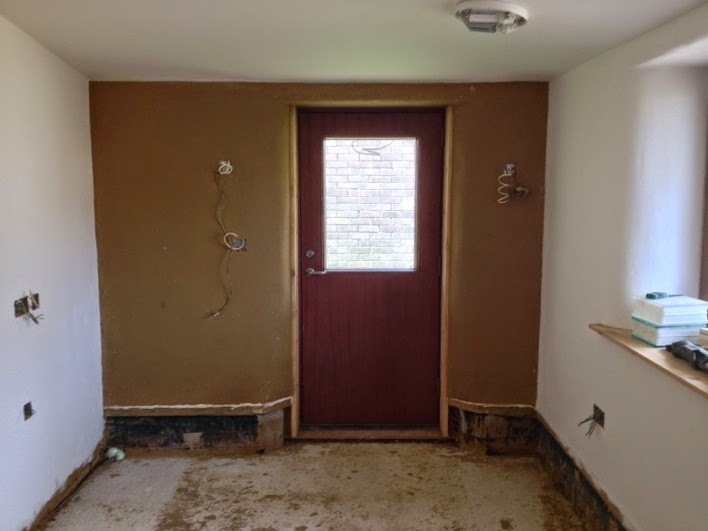 Once the plaster had stiffened up a bit we trowelled it down again, at least once, then when it was nearly hard trowelled it down with a plastic trowel which made for a smooth and unblemished surface. For the finish coat it was usually ready for the final trowel the day after application - the backing coats were totally dry before the finish coat was put on, so they sucked the moisture out of it and dried it out quite fast. Right then, here're the photos. There's a dip in quality for a while. The photos are all taken on my phone which is in a mostly me-proof case - but the lens cover of the case got increasingly scratched making for some blurry pictures. I caved in and got a new case eventually, so hopefully the more recent photos are better quality. 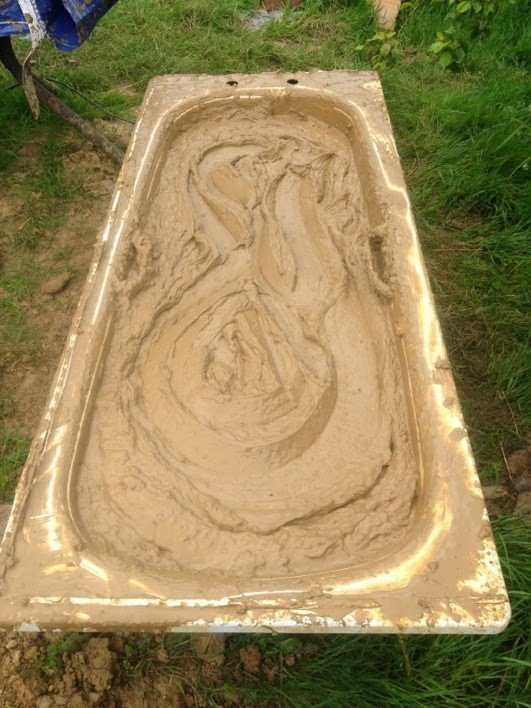 The mountain of clay from the raintank and soakaway holes, and the bath. Clay is much easier to mix if soaked in water overnight. 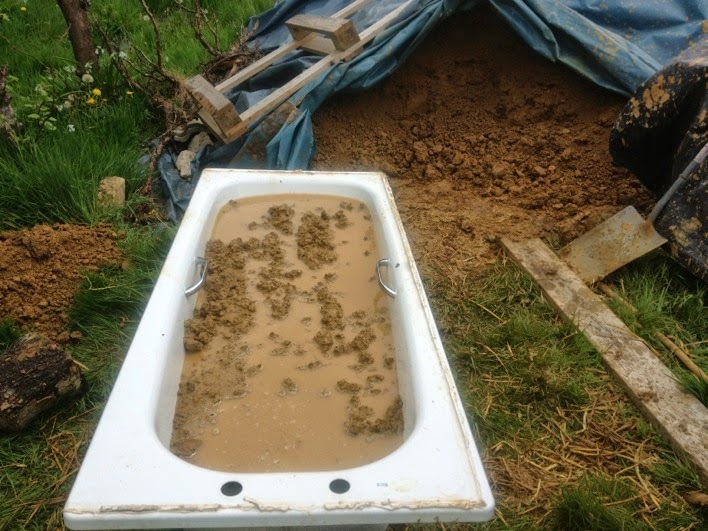 A bath full of slip, ready to be diluted a bit and then put on the bare bales. It's messy, but fun. 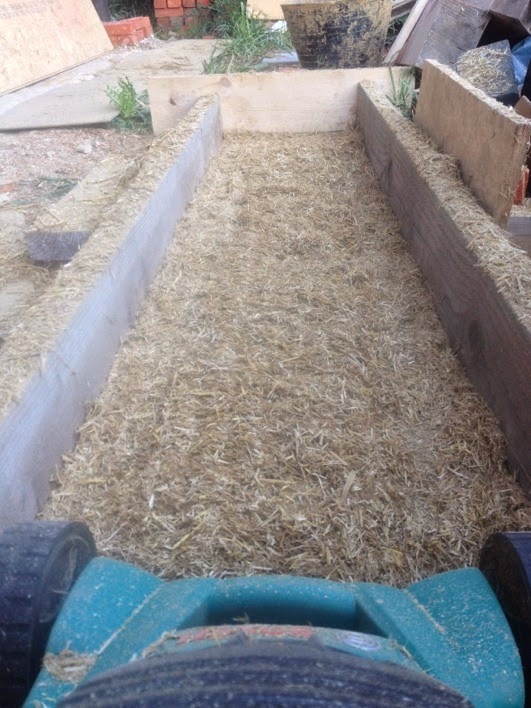 The slip coat makes an excellent surface on the bales for plastering onto. 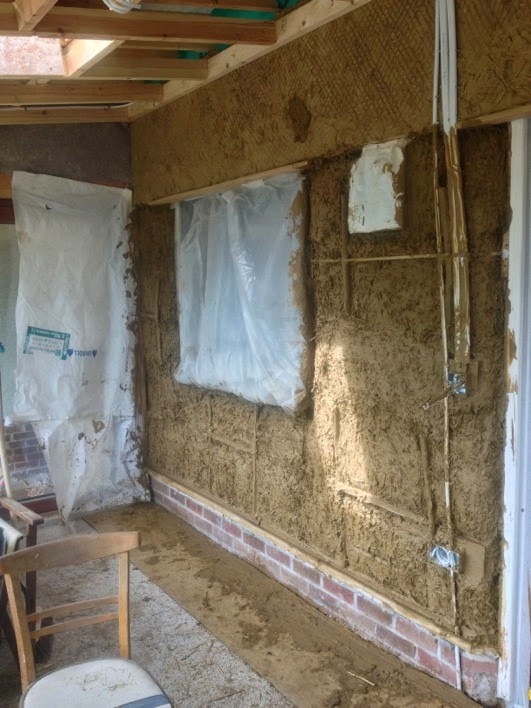 Complete slip coat in the sunroom, with previously clay-plastered stud and reed mat wall section above. 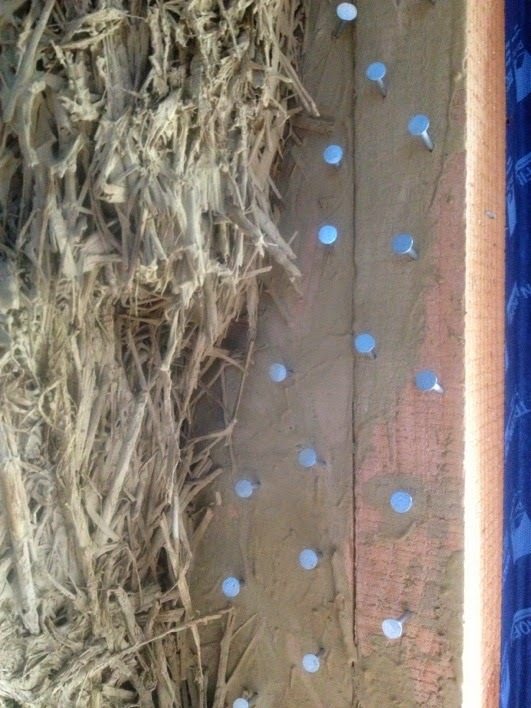 Reed mat/lath on timber stud internal walls. 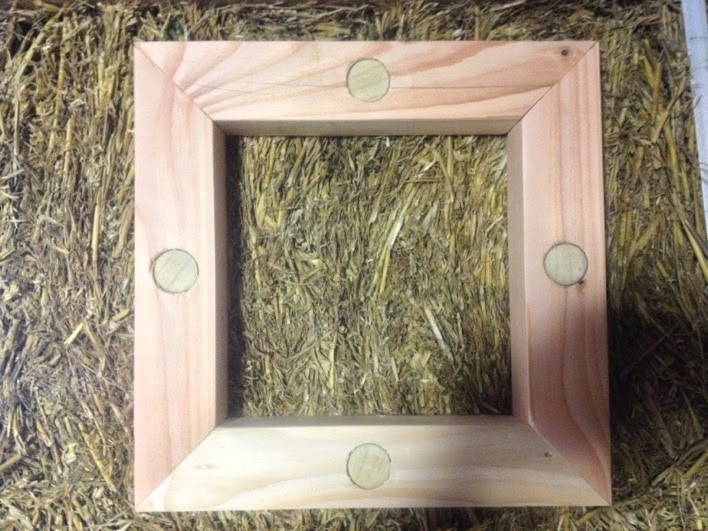 Frame for a truth window, pinned into the bales with dowel. The straw inside will remain bare, to reveal the true construction. Preparing to fix window boards. Strawbale building sites are not good places for a vampire to be (probably said that before). 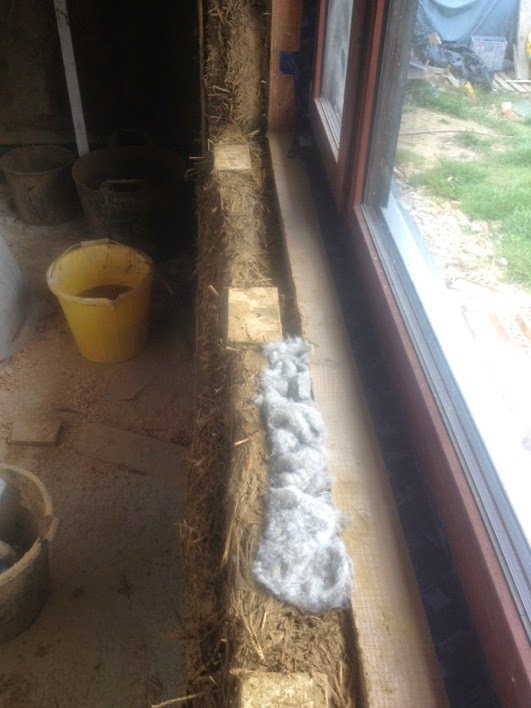 Long straw and clay slip mix bridging the space between timbers, sheepswool insulation filling the gap behind. (on this big window I fixed bigger bits of wood to the stakes to provide larger fixing points). Galvanised nails in the timbers around the windows - providing something for the straw and clay mix to grip, as I fill the holes from straggly bale ends. A half sculpted window reveal. 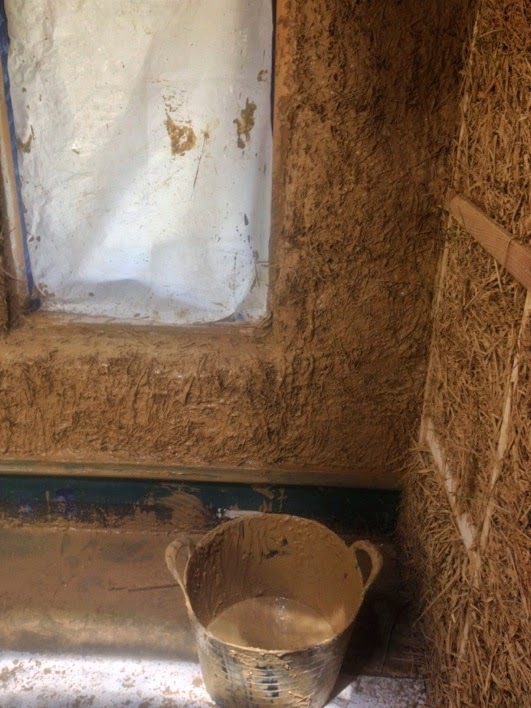 I've used woodwool board to bridge between the bales and the window, allowing me to clay-plaster right up to the window. Original plan was a timber detail here, but we hadn't realised how big and how close to the edge of the frame the window hinges would be - there wasn't room to fit a timber that would be strong enough. The wood wool is a compromise, as the wood strands (good) are bonded with cement (bad, very bad). Finished long-straw scultping of a door reveal. Hollows in the wall filled with the long-straw mix. and another window reveal. Also showing window board fitted, screwed into the stakes from the earlier photo. Lawnmower's eye-view of its vanquished straw. The patent straw-chopping enclosure was later modified with higher sides to contain more of the straw (wear a mask when chopping, there's a lot of dust). First coat going on a reed mat wall. 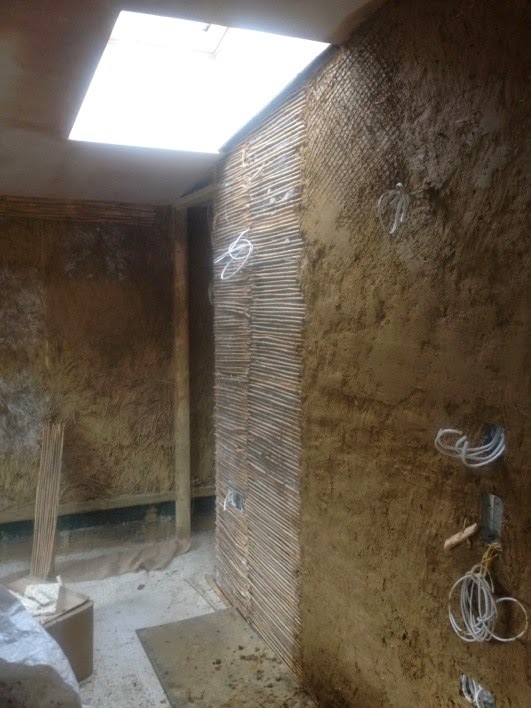 And onto the straw-clay wall in the middle. I had a brief flurry of lovely volunteer activity around this time. Thanks volunteers - you're great! First bit of body coat, starting to see those lovely round reveals come together. 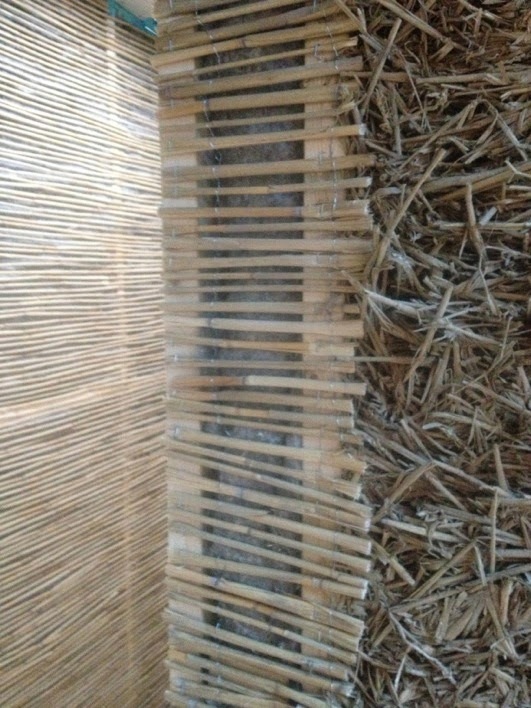 The reed mat at the top bridges the timber roofplate/box-beam, allowing it to be plastered over. 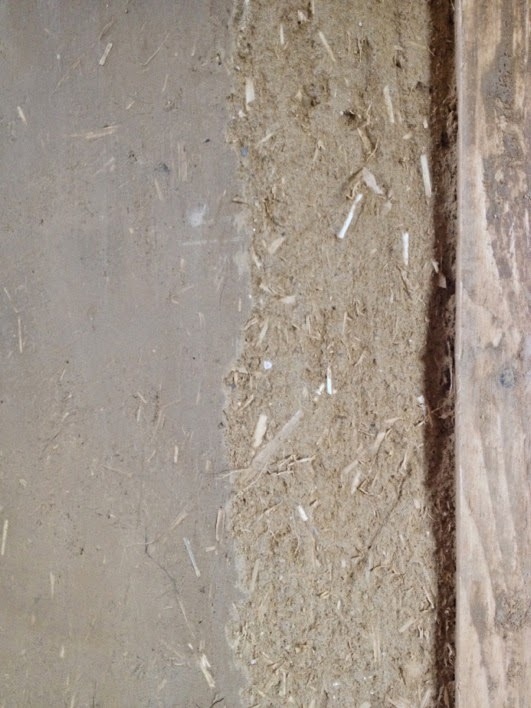 The join between roofplate and bales is skrimmed with hessian to prevent cracking (a length of slip-soaked hessian is bedded into a layer of clay plaster). 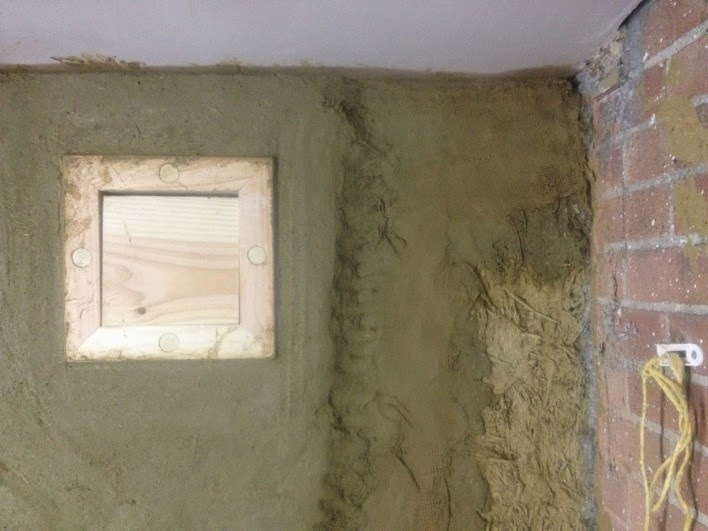 The same is done over cable trunking, to prevent cracks as the plaster shrinks over the solid objects. 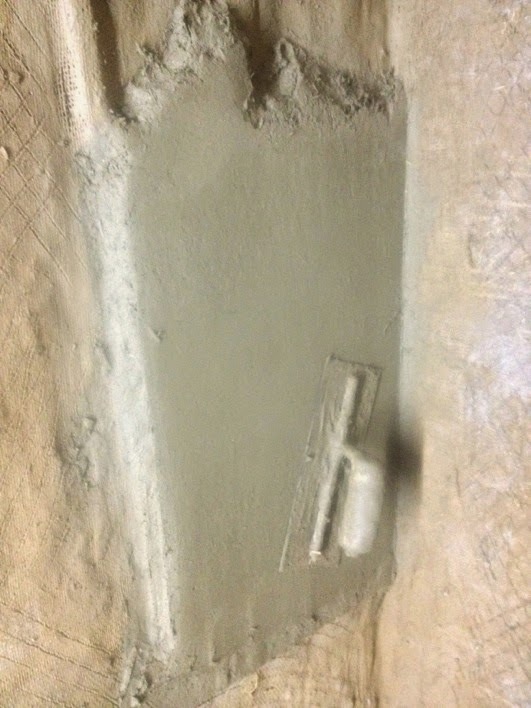 With clay plaster it's easy to keep your tools handy. A section of wall where we experimented with "floating up" the wall with a plastic float, giving a render-type finish. We both loved it, right until the point we painted it white, when we both hated it. It's now been painted a darker colour, we like it again, and thankfully this happened early enough to be able to ensure that all the other walls were trowelled as smooth as we could get 'em. 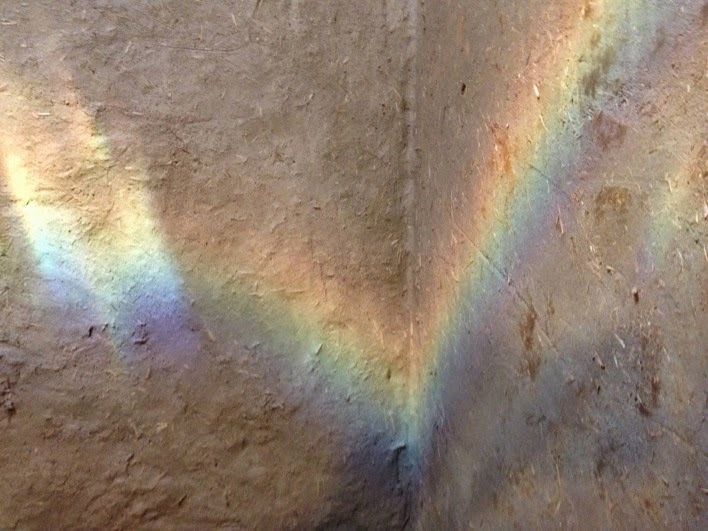 Rainbows of light from the solatube in the ceiling. Fresh finish coat in the bedroom. I really love doing the curvy door and window reveals. They make me happy. Did I mention how much I like the curvy reveals? 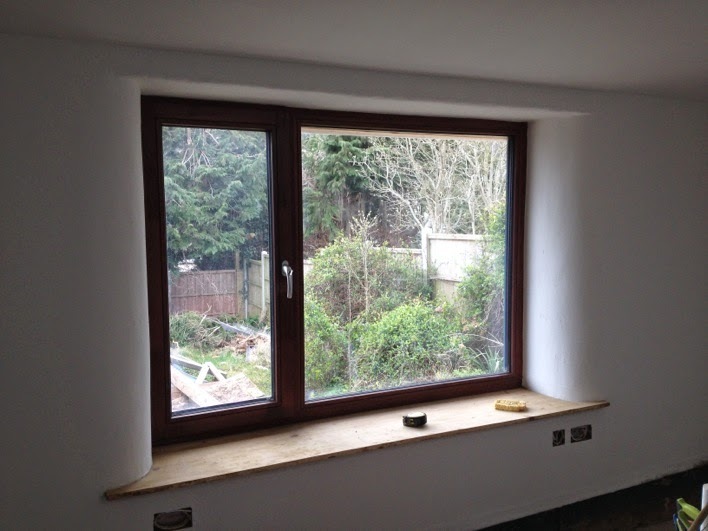 Although not part of the original plan, using the wood wool to allow plastering right up to the windows has made for a finish I'm really pleased with. 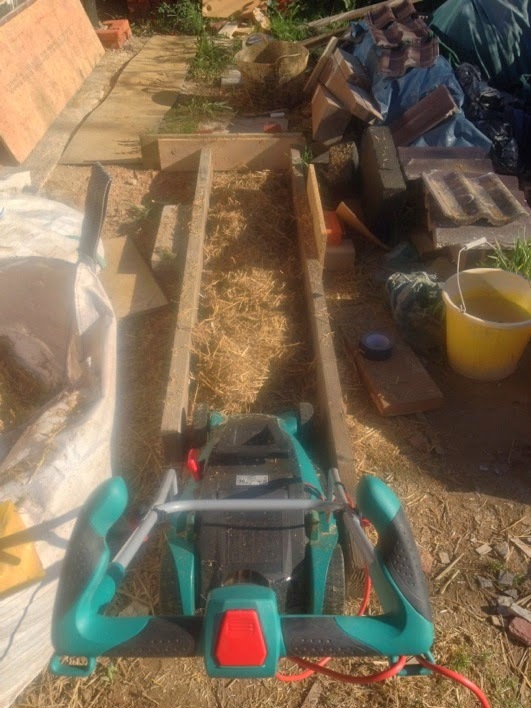 Probably I could have used off cuts of reed mat instead of the wood wool board, which would have better (more sustainable). A bit of finish coat scraped back - the scraped back bit was really dusty when rubbed, in pleasing contrast to the hard and durable trowelled surface (to the left). Curvy reveals, exciting view (just wait until we build a fence in front of it), and a selection of PPE. Light doing lovely things in the light well. After initially being highly unimpressed with the colour of our otherwise wonderful clay, we came round to the idea of keeping some walls unpainted. This wall is treated with a wall-glaze (the clay-paint base without any pigment) which helps protect the surface and make it wipe-cleanable). After so much time covered in mud I'm finding this new clean phase really odd. This will be my office/musical play room. Another glazed wall. 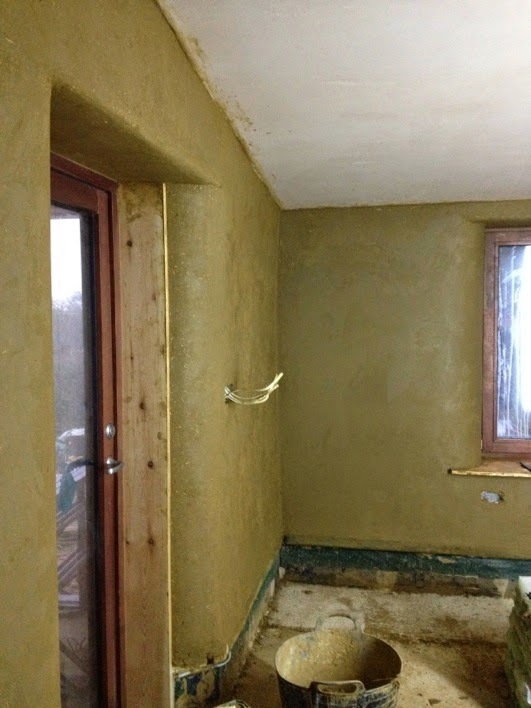 Clay plaster really is so lovely.